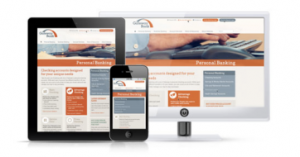 Gateway Bank, a community bank in Mesa, AZ, has positioned themselves at the forefront of online innovation by creating one of the first financial institution websites that is fully “responsive” (meaning it automatically adapts to any viewing device). Gateway Bank has grown significantly since opening in 2007 and has become known for its warmth, personal service, and community focus—something their customers say they haven’t found at other banks. However, Gateway’s team realized that the unique in-person experience their customers were getting wasn’t translating online. The website wasn’t doing them justice, and they needed help figuring out how to communicate what makes them special. With this mission in mind, Gateway sought the help of Chandler-based Forty, a customer experience design firm that provides high-end branding and design services for businesses nationwide. Forty worked with Gateway to realign their brand experience and design a compelling responsive website that automatically adjusts to multiple screen sizes, helps people find the information they need quickly and easily, and conveys what makes Gateway Bank so unique. Gateway is blazing a trail with their new website and providing their customers with a more consistent and impressive online experience. Visit gcbaz.com to learn more about this remarkable bank, and to see a responsive site in action. Still need more reasons to choose a local bank or credit union? Check out the top 5 reasons to make the switch from the Institute of Local Self Reliance!